This beautifully constructed pewter clockhas skillfully crafted footers to allow the base structure to hover over any surface. 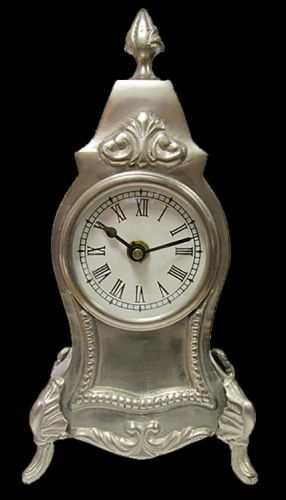 The clock face is accompanied by roman numeral numbers and two black clock hands. The top and bottom of the clock are accented with engraved designs that make it perfect for any side table or fireplace mantel.